In “The McKinsey Way,” author Ethan M. Rasiel presents numerous insights to problem solving, analytical reasoning and effective communication practiced by consultants from McKinsey & Company, one of the foremost management-consulting firms. When a typical associate joins McKinsey & Company, she “will have graduated near the top of her college class, spent two or three years working for a large company, then received her MBA from a top business school. She will be in her mid- to late-twenties. On her first engagement, she may have to present her analysis to the CEO of a Fortune 50 company, who will not give much credence to what some newly minted, 27-year-old MBA has to say — unless she has an overwhelming weight of facts to back her up. This is just as true for a junior executive presenting a proposal to his boss. One of the primary facets of our work is to sell ideas — to lead and persuade an audience to appreciate our arguments or our perceptions on a certain topic or problem. 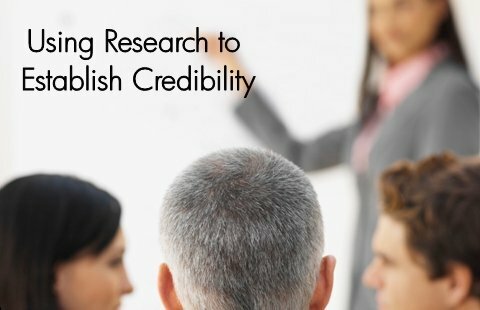 Credibility is the cornerstone of persuasive communication. Many of us mistakenly presume that credibility is an entitlement—a function of our positions or affiliations. We fail to realise that credibility is a virtue we earn and preserve over time. The single most effective approach to establishing credibility is to demonstrate concrete foundations to our proposed thoughts — to draw on meaningful information and deduce concrete inferences in support of our positions. 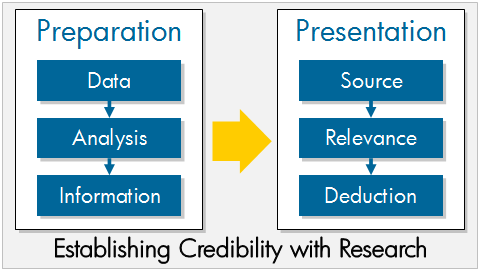 Collect facts and data from reliable sources. Interpret data and demonstrate its relevance. Deduce and structure your arguments in a logical manner to lead people to draw conclusions you would like them to. Include particulars (data, analyses, information) of your background work in an appendix to your presentation or report. Bear in mind that people trust a person’s thoughts so long as they trust the underlying research.